This is my take on the journey, a one-sided view. I didn’t know Nancy before we embarked on this trip. We met once in person beforehand. From our conversations, I knew everything would be fine. She is open, warm, interested in everything, funny, and disarms everybody she meets. She thinks about others all the time and gives the best to them. Along the way, we talked to so many different folks because of her curiosity and willingness to engage anybody in conversation. It would have been a very different trip on my own. 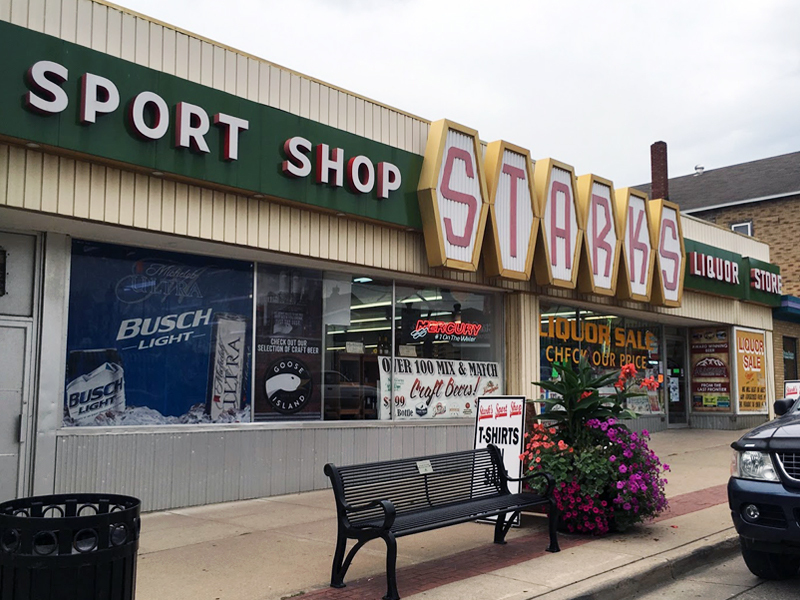 Before I learned of Nancy’s project, I had planned a visit to my birthplace, North Fond du Lac, Wisconsin. My family moved to Oklahoma when I was nine. I have never been back. What might have been if I had never left loomed large in my imagination. I was researching other places in Wisconsin to include on the trip when I discovered Effigy Mounds National Park. I’ve known about Native mounds for a long time. I don’t know how or when I learned of them but I’ve made several trips to see some of the famous sites: Cahokia, Chillicothe, Great Serpent Mound, Spiro Mounds. They are ancient and mysterious. The people who built them lived a very different way of life, attuned to the land, animals, the seasons, each other, the cosmos. I knew this would be a great candidate for Nancy’s project. The motivation behind my original trip was to learn what Wisconsin imparted to me. How did being born there shape my personality, my identity? Because I had never been back, was it a mythological place that enticed me but didn’t exist? As for the significance of the mounds, I was looking for something transcendental, more meaningful than my boring daily existence. I wanted a spiritual event, like being born again in jail. I wanted in on secret knowledge. Maybe getting close to the artifacts left behind would transmit something transformative to me. That said, I think motivations are tricky. Beforehand, they are vague impressions. Afterwards, they change by what your experience. Writing after the trip, I may only be understanding them now. Theses feeling may not have been there in the beginning. While I had plans for a different trip, I didn’t want to subject Nancy to a nostalgic return to my childhood home. I wanted to focus on the mounds. They interested both of us. It was an added benefit that she would be able to reunite with an old friend in Madison. I’m so glad she chose this journey. Day 1 (Thursday): Fly into Madison and meet with Jerl Richmond, Nancy’s old mentor and friend, separated 23 years ago. Drive to McGregor, Iowa, where we were staying for the next 2 days. Day 2 (Friday): Visit Effigy Mounds National Park; Take the guided tour; Explore the park and area on our own. Day 3 (Saturday): Explore weird and interesting things while slowly making our way back to Madison, for a very early flight home Sunday morning. What Was the Trip Like? We had an early morning flight with seats apart from each other. For the most of the 2+ hours, I read and didn’t think about the trip. It wasn’t until we began our descent that I started to get excited. I watched as we approached Madison. I was amazed by the amount of water: ponds, streams, lakes. I didn’t know it was like that. In Madison, we got our car and drove to the university to meet Jerl, Nancy’s friend and former boss. I felt strange standing under the Wisconsin sky, like it was familiar and part mine. Jerl was warm, generous, quick to laugh, and made us feel completely at ease. We ate lunch at an Afghan restaurant while he and Nancy caught up. We got to talking about the mounds and our purpose. He told us of Man Mound in Baraboo, and of his friend Rob Nurre, caretaker of Man Mound and an expert on mounds in general. We hoped to meet him on our way back. After reading this I wondered if the “distinctive agricultural landscape” of the Holyland was something in my aesthetic. Surely, the land where I was born and spent nine years informed what was naturally beautiful to me? Later, when we left Madison for McGregor, Iowa, we travelled Routes 14 and 60, scenic roads that follow the Wisconsin River to the Mississippi. The longer we were on the road, the more “at home” I felt. The rolling hills, the river peeking through the trees in the bottom land, the small towns and corn fields, all felt so right. Even the color and texture of the dirt, deep black along the river, yellow and brown on the hillsides, were so different than the harsh red soil of Oklahoma. It was soft, fertile, inviting. I felt love for the landscape. Around Spring Green, we saw a large historical marker. We stopped to read it. It commemorates Frank Lloyd Wright and his house and school, Taliesin, just 6 miles down Route 23. We decided we would visit it on Saturday, on the way back to Madison. When we crossed the Mississippi at Prairie du Chien, we could see the high bluffs on either side of the river. It is a dramatic environment, the river fragmenting into many smaller channels, mist and fog swirling around the bridge. My excitement was growing as I anticipated seeing the mounds the next morning. As I said before, I have seen other monumental mounds. Great Serpent is a wonder. 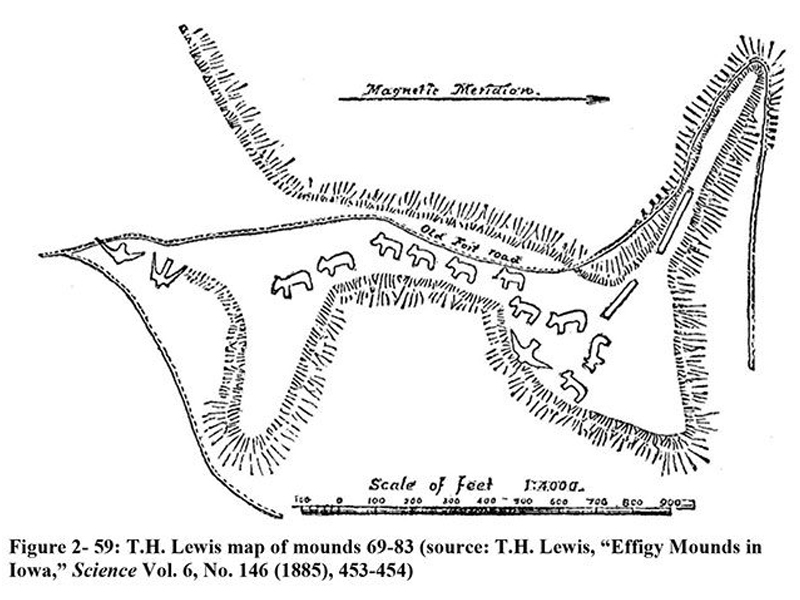 When I went to Spiro Mounds, there was a mountain by itself, surrounded by flat floodplain. At the time I felt certain that mountain played a major part in why the mounds were built there. The landscape was integral to their placement. I knew the next day we would be seeing the largest concentration of effigy mounds in the country and I felt an expectation of grandness. We finally arrived in McGregor, Iowa, an old Victorian town. It felt like every small town in my life, pleasant and sad. 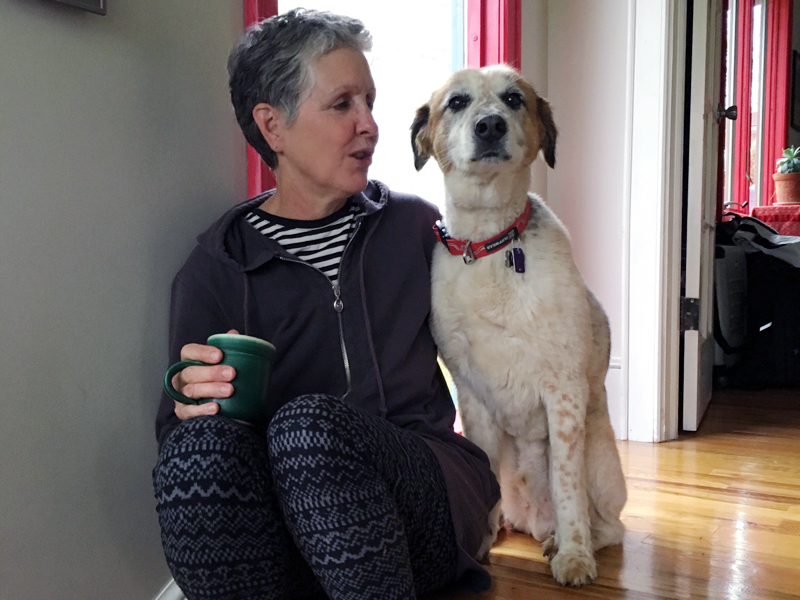 At our Airbnb, Sandy, our host, came to visit us. Nancy and I were quite hungry and asked about a place to eat. She informed us that everything closed at 8 pm, except for the gas station, which had some basic groceries and Josie’s River Queen, where we could get a bar pizza. We drove quickly into town but it was too late. Everything had just closed. We had fun trying to get food at a couple of different places but eventually went to Josie’s. We ordered a pizza and some beer. Soon, we were in conversation with Kathy, the bartender. We learned about Josie and Bob, the owners of the River Queen; the old hotel that was destroyed by a group of greedy developers; the former superintendent of Effigy Mounds, Thomas Munson, who stole the remains of 41 people from the park and stored them in his garage for 20 years; and the bad economy. I’ve lived in many small, dying towns, filled with people who have lived there all their lives. Usually the people are older, the kids leaving to find jobs in bigger cities. I have such mixed feelings about these places. The folks are generally open and inviting but the atmosphere of the place, the hopelessness, makes me want to flee. I felt that about McGregor, Prairie du Chien, and Marquette. It could be a projection. When we got back to the house, it didn't take long before we both fell asleep. The next morning we were up early and went to the park, which was just a few miles down the road. On the north side of Marquette, we were stuck in traffic for some reason. In one of Nancy’s fearless displays, she jumped out of the car and ran up the road to talk to the person handling the traffic. What they must have thought to see her do that! I admired her impulsiveness. At the park, we signed up for the tour. Our guide, Michael Douglass, was personable and energetic. Right outside the office, we crossed a bridge over a dry creek and saw the first of the mounds, 3 small hills. They didn’t look like much. I wondered how they knew these were mounds and not just outcroppings. The trail ascended a large hill. Halfway up, we stopped at a limestone rock that vented cool air from the underground. Michael talked about the mountain breathing. I had an image for a story of a family walking up the trail, the young boy lagging behind making up tales of the creatures under the rocks. After a long walk to the top, we saw the first of the effigy mounds. Frankly, I felt disappointed. Maybe it didn’t help that when we saw the first bear mound, Nancy compared it to a Chia Pet. She was absolutely right though. Most images of the mounds are shown from the air, outlined in white chalk in the winter, through leafless trees, or black and white drawings made by surveyor/explorers. When you are standing next to them, you can’t see the whole thing. You know it is a bear because of the sign and the images you have seen. But it really looks like a slight rise covered in tall weeds. If the park didn’t mow the grass around them, you wouldn’t be able to distinguish them from the rest of the hilly ground. I tried to hold on to a sense of awe, but it was fading. We continued past different mound groups and ended at Fire Point, a scenic overlook on the high bluffs overlooking the Mississippi. I began to understand something standing at Fire Point, and later, at Pikes Peak. As at Spiro, the site where the mounds are built has as much significance as the mounds themselves. Here I was expecting the mounds to be grand. They are not. They are like worn tombstones, time and weather sanding them down to nubs. We then went to see the second set of mounds in the south part of the park. They are known as the Marching Bear Mound Group (see the line drawing above). Individually, they are not that impressive. Yet when you see the line of marching bears ascend the hill, culminating in a pair of birds about to launch themselves over the river, it’s the collection within its place that is meaningful. This was to be reinforced yet again when we went to Pikes Peak State Park and stood on the overlook, high above the valley. Vast forces were at work here. Time was different. The bluffs surrounding the river defied the glaciers during the last Ice Age, forcing the miles-thick ice to flow around them. Yet, the river flowing endlessly, softly, carved its way through them. My spirit soared over the water like the birds. The old people must have felt the same way. We stayed here for a long time. I didn’t want to leave or talk. I wanted to fly. I wanted to take the essence of this place and put it inside me. It was hard to leave Pikes Peak but fatigue and hunger set in. 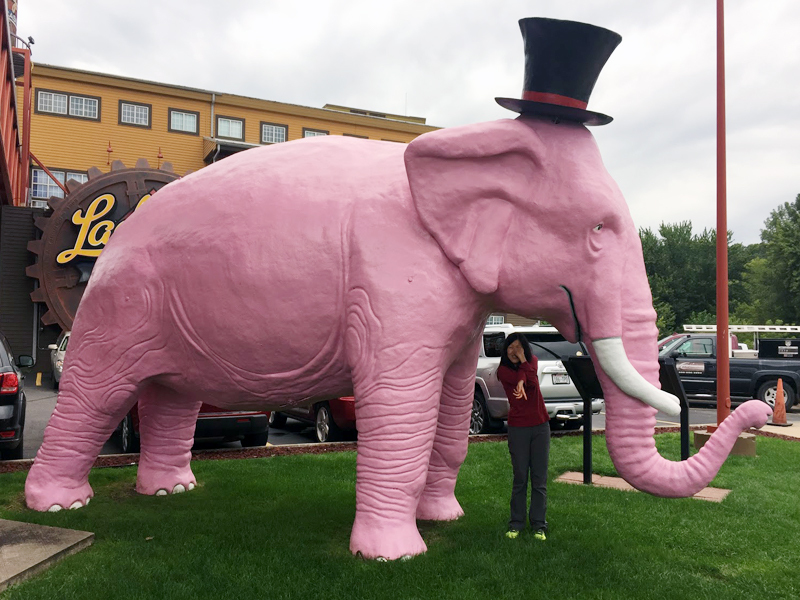 We had coffee and dinner at Prairie du Chien, stopped at the Casino in Marquette, then finally wound up back at Josie’s. This time we met Josie and Bob, Dennis, and John, Sandy’s husband. After a while, John invited us to join him and Sandy at the other bar in town, the Pocket City Pub. We spent the evening getting to know them and their friends: Dan (he and John travel together on their motorcycles), Ponderosa (a farmer in the area and “god’s gift to women”), Mel (the bartender), and a couple of other folks whose names I forgot. All very kind and welcoming, the Midwestern openness. I definitely inherited this same politeness. The next day we left McGregor and travelled on the south side of the Wisconsin River to Spring Green. 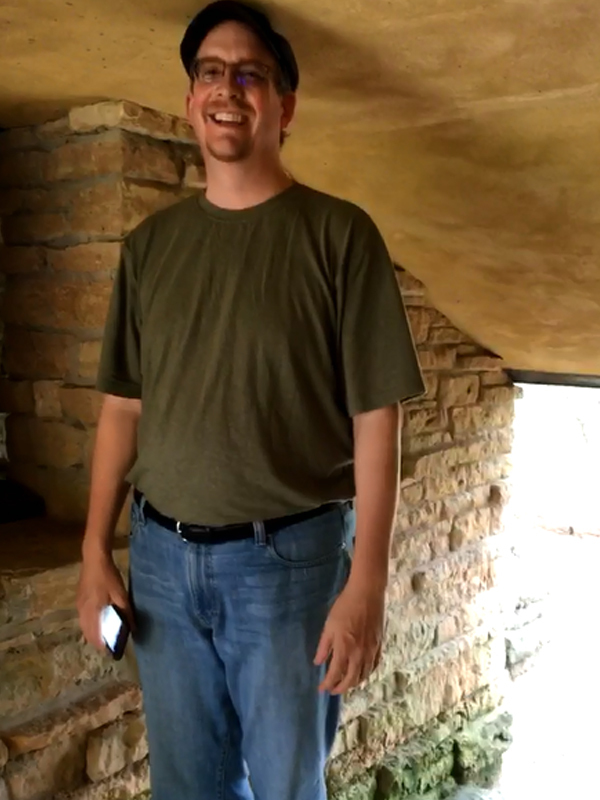 After endless miles of cornfields, we arrived at Taliesin, Frank Lloyd Wright’s home and school. We were both tired. It had been an intense trip so far. We decided to go on 2 tours, one of the school and one of the home. At the outset of the tour, we both liked his architecture. After 3 hours of Frank Lloyd Wright, we both began to despise him as a person. What an ego! But the setting of Taliesin, my god, it is so beautiful. He knew how to build a place in tune with the land. We arrived back in Madison in the late afternoon and departed very early the next morning. After lunch and coffee in Manhattan, we took leave of each other and arrived back home. What do I Think of the Trip? The trip was, at its simplest, a fun adventure. Nancy’s openness and curiosity made the trip so enjoyable. We were never locked into plans. We made our way based on our mutual curiosity. What’s around the corner? We went to the casino in Marquette because we didn’t want to go there. Nancy said, maybe we should go because if we are trying to understand the area, this is also part of it. I’m glad we went...we won $30! The mounds still intrigue me but their meaning has changed. It is not so much about the mounds and why they were built. The question has become why did they build them in the places they chose? Place shapes culture. It was true for prehistoric native people, as well as Frank Lloyd Wright. He could not have created his architecture had he lived anywhere other than the hills of southern Wisconsin. I was born in Wisconsin and was happy there. I moved to Oklahoma and hated it. I go back to Oklahoma every year and find things I like but mostly I still don’t like it. Wisconsin remains my Rosebud, as it were. Something golden because I haven’t—and probably can’t—return. And maybe it’s good that I haven’t gone back. That’s the draw of nostalgia. We forget the present humdrum by indulging in a warm dream. It’s healing in a way. On my recent return to Oklahoma, I told all of my family about the trip. I asked them all about the mounds and the Holyland. Nobody knew any of it. None of my brothers remembers anything about Wisconsin. I can’t believe it, when I have so many vivid memories of it. I suspect the impact that Wisconsin had on me was largely subconscious—the color the sky, the trees and farms, the deep snow— rather than anything so concrete as the mounds. Maybe this return was like going to therapy and bringing the unseen influences to conscious light. Capturing our trip together has been extremely difficult. I am having a hard time putting anything down because I still feel confused about what I am looking for, and I know that everything I say is filled with that confusion. Nancy and I drove from New York to Union, West Virginia instead of flying because I thought we could experience the changing landscape and it would give us more of a sense of place, specifically the South. For seven hours we talked a lot about our own lives: I have one parent from the South and one from the North and have recently understood that I have ancestors who were enslavers; she is from parents who immigrated their family to the US from Korea. I grew up in New York, Nancy in DC. I wondered how we are informed by our heredity and ancestors when we don’t have direct experience with their historical, geographical and cultural contexts. I was hoping this trip would help me face a heredity that includes enslavement and also help me better understand the relationships of European and African Americans. I wouldn’t have gone without Nancy’s “contest” to name the place that is calling you. It felt like amazing serendipity to be able to take this journey with someone who could be objective and who, as an artist, was looking for people to engage. As we drove south, I talked of my interest in the overlapping histories of black and white people. I think my racial identity was confused as a child. Though I lived as a white person within what is mostly a segregated white culture—even in diverse New York City—there was an emotional part of me that identified with what I saw as a black sensibility, and I have struggled with—and not been able to reconcile—the polarization of race. Nancy described her experience of the tension between black and white cultural identities in public school and her own position as an Asian American moving within that. I had been reading a lot about the history of slavery so we talked about it and Jim Crow and the current state of violence and segregation. It matters to me if there are distant relatives who are black because not admitting we have a shared cultural and genetic past has been central to the denial required to sustain institutional racism. What kind of character and ethics have been passed down in my family, a family that was able to compartmentalize race when dealing with friends, neighbors, employees and possibly their own family members or children? The drive was highway all the way down and into the midst of the Allegheny Mountains, which were rounded, green and misty. Driving did not really bring us any closer to knowing a landscape than looking down from a plane. Nothing on this trip was going to give itself away easily or become clear; our heredity is still in flux, there are no simple answers that are true for all. I am a little lost. Union was where my great, great grandmother with the diary was from and where her grandfather’s will listed slaves. Nancy booked an Airbnb with Lynn in Lewisburg, the next town over from Union. Lynn had come to West Virgina from the north decades ago when there was a migration of people looking for a rural life, communes and traditional knowledge. When Nancy and I introduced our trip to Lynn, she gave us the names of people to call: the director of the historical society in Union; the owners of Elmwood, a Greek revival house built by my ancestor with the will; and a woman who had curated an exhibition to commemorate African Americans. We began to see a relationship between north and south, a flow back and forth by both whites and blacks. Here again, there would not be an easily identifiable, static and two-dimensional way to recognize regional culture. And yet I know there are nuanced intricacies inherent to the history and people of this place that we could not see. Nancy and I worked as a team. When one was hesitant, the other stepped forward, and we bounced off each other to ask more questions and to help diffuse situations. Nancy distracted Larry, the part-time archivist at North House—Lewisburg’s historical society—with questions about the town’s asylum, while I tried to probe into questions of race. Larry showed us the ledger of Anthony Carter, a slave freed by Henry Erskin. Carter, formerly a grave digger, became a successful cobbler. Larry showed us stacks of registration papers from after Emancipation when blacks had to register with the court house and carry papers. They were required to have a job and a place to live. Otherwise, they had to leave the county to avoid being jailed. I asked Larry why he thought someone would be freed. I suggested it could be because of blood, but Larry said he wasn’t so sure. He told us of Carol Haynes, a lawyer in New Orleans who had been tracing the “tiniest records of blacks” because so little was recorded. Larry claimed that the locals didn’t have a problem with race and he attributed hard work to where he was in his own life. When I asked him if he would have had the same opportunities were he black, he conceded that he would not. We were invited to Elmwood in the evening. Driving to Union was quite pastoral with green, spacious and rolling land. From the road, Elmwood appeared on a hill to the left. Red with white columns, it was dramatic and ostentatious. A house inspired by Jefferson’s Monticello, it was built in 1835 to impress the young wife of Hugh Caperton. It smelled of paint and wine when we entered. The owners, Chris and Anita, had been renovating the neglected building for three years. When Chris referred to Elmwood as my “ancestral home” it left me cold. I cannot place myself in relation to the geography, architecture or surnames. The gap between my grandmother’s grandmother and me is too big. I don’t have any real sense of belonging to this history, yet something nags at me about it. Like cobwebs, there must be something that sticks to us from the past that we can’t see. Chris and Anita told us a Civil War reenactment was scheduled for August and they really wanted to see my ancestor’s diary for authentic stories from that time. We asked if a Civil War reenactment wasn’t problematic. Chris described himself as a self-made man. I asked pointedly if his success was more possible because of the currency of his skin color and he admitted that it probably was. Nancy turned our discussion to current politics. The cemeteries were traditionally segregated. Nancy found Alice Beulah Caperton’s stone at Greenhill, the white cemetery; I put buttercups in it for the grandmother of my grandmother. We also went to the black cemetery. On an opposite hill behind Elmwood, it was much smaller, with wire fencing and a pasture gate, surrounded by calves, cows, and buttercups. We found the tombstone of Oliver Twist Dickens. On our way down we jumped an electric fence. It should not have been a surprise that finding African Americans to talk to was harder than finding European Americans. We did not see many African Americans on the streets in either town. The black population there is now quite low, especially in Union. I think the population was 50/50 at the beginning of the twentieth century. 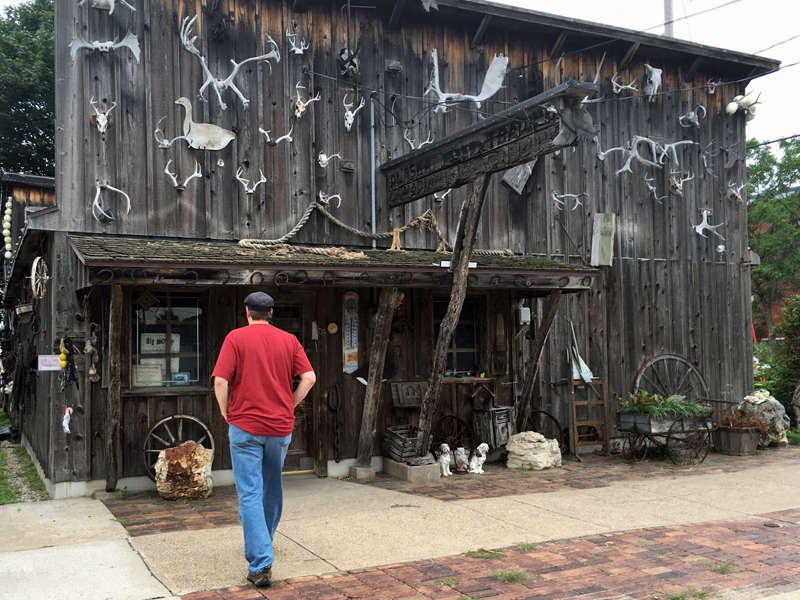 Lewisburg seemed like a tourist town without many locals visible. There are no black churches in Union; when there were only a couple of congregants left, they donated the last black church to the historical society. There are still two black churches in Lewisburg, one Baptist and one Methodist. I called Janice who had mounted an exhibition of photographs of African Americans, “Invisible Roots and Legends” at Carnegie Hall, Lewisburg’s cultural center where our host Lynn is the Artistic Director. The project was a result of returning to the area after 40 years and discovering “there was nothing about African American history… it was almost like they were invisible.” “We’re all connected somehow,” she continued. “These photographs are a way of opening up history so we can talk about things.” She said she was surprised that the show was so well attended by both whites and blacks, and by how moved they were. She asked me what I was after; I told her I wanted to open up my past, acknowledge it and ask questions of my position now, but that I was pretty lost in it. She told me I was brave and to keep working. We had an appointment with Fred, Director of the Monroe County Historical Society in Union and Professor Emeritus from the University of Chicago. For us, he opened the historical society—formerly Hugh Caperton’s office—although it was off-season. I had no idea the family name and the diary would act as such access tickets. Ron, a retired dentist from Baltimore, who was raised in Union joined us. He and Fred said, “We heard you had a late night with Chris and Anita.” When I asked about race relations, Ron said racial problems were in the past. I asked about shared genetic histories between whites and blacks from slavery and there was general acknowledgment only, nothing local. But, he recalled a couple of black people at a white funeral who said they were there because they were related. Fred, a geologist, told us about the tectonic plates that collided millions of years ago to form the Allegheny Mountains. I bought stapled publications titled “Elmwood Letters” and “Slaves of Monroe County” which included introductions written by Fred. In them are lists of names. Sometimes noted are descriptors as mulatto or black, monetary values and names of purchasers. Mother’s Day. We decided to see if we could attend Sunday school at Tabor Baptist Church. As we pulled up, so did Paula, a member of the congregation who moved from Brooklyn. When I asked if we could visit the service even though we were not dressed for church, she told us we were welcome in God’s house and lent us her workbook. Nancy had not thought of New York as being segregated, but meeting members of the Tabor Church who settled in Lewisburg to escape the violence in the Bronx and Queens pointed to the segregation in New York. This was another example of changing social landscapes… and the relationship of north and south… and histories of migration and the effects of segregation in different parts of the country, in different ways. Then Nancy and I drove north talking the whole way just as we had going down.